As teased previously, a gardening event involving sunflowers would be taking place, and we can now reveal that it will be called Bloomin' Beauty with Kappn'. This is yet another gardening event, and revolves around a sunflower theme, including the rewards. To tie in with this event, two sunflower terrains will also be added. Some new villagers have been added, who'll be arriving on July 15th. 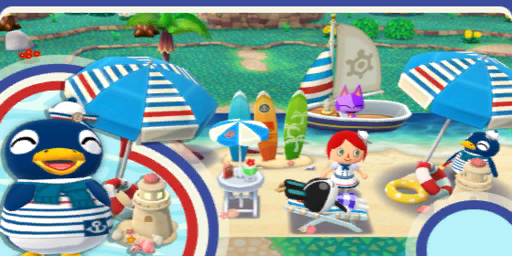 These villagers are Pekoe, Julian and Boone. Molly, Kidd, Elise, Penelope, Cube, Cobb and Gaston have also popped up, but have no data alongside them, implying they'll probably be added into a later update, as we have seen previously. Some new fish and bugs will be coming on July 6th, including the Barred Knifejaw, Clownfish, Crawfish, Cyclommatus Stag, King Salmon, and Surgeonfish. The Pearl-Oyster Shell will also start washing up on the beach. As always, a bunch of new clothing and furniture has been added. Whilst these pieces will likely be released with the new villager wave, a new gift for all item, the bamboo grass, will be handed out to players from July 7th for a month, in celebration of Tanabata. And that just about does it for this datamine. As always, thanks to the folks over at reddit for the datamine. Be sure to follow us on Twitter and Tumblr to keep updated with the latest Animal Crossing news!